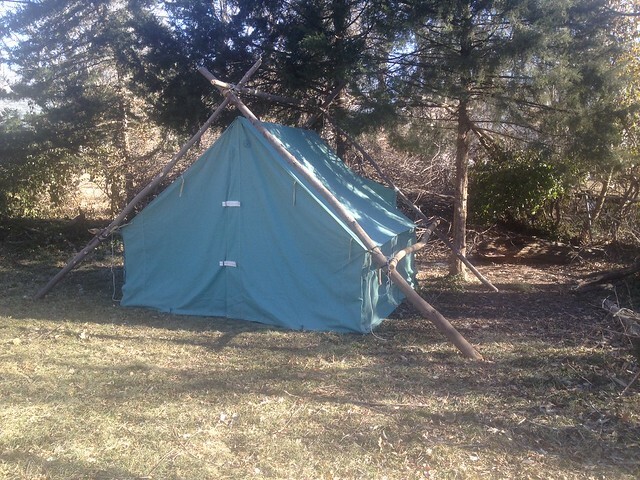 Looking for a real, old fashioned, made in the USA canvas wall tent? I just found a deal. These were made on a contract for a scout camp that fell through, so I am able to buy them at a steep discount. These tents are all either new or very, very close to it (used maybe a week). These are perfect for family camping, hunting camp, or use at a bushcraft retreat. They measure 9 feet wide, 7.5 feet long, 7 feet tall in the center and 3ft tall on the sides. Perfect size for 2 GI cots on the sides with room in the middle. Some minor construction details may differ, but they will all be essentially the same as the picture. 4 tent stakes included, poles are not included at this price. This works to make it much cheaper because shipping the poles almost triples the shipping price, so you get a better deal if you make or buy some locally. This also gives you the flexibility to either use poles or build a framework from PVC. I will include a set of plans to build the frames with the measurements for either a frame or poles. I can also get stove jacks for an additional $75.00. That price is killer for a canvas tent. Well then, spread the word . Very cool piece of gear. Canvas rocks! Man that pic brings back some memories from boy scouts. I use to live in one of those for 8 weeks every summer. I bet these will fly out of your shop. Those certainly do bring back memories! Spent a few weeks in them as an assistant when my boys were in Scouts. Wish I had the cash to drop on a couple for old times sake! 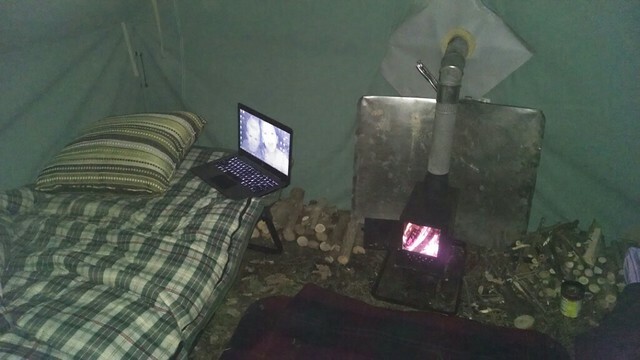 With a stove, cot and small table, a guy could make a killer deer hunting camp with one of them!!!!!!!!!!!!! Beast, you sure come across some cool stuff!! I'm late to this thread - was just searching for boy scout tent on Google. Are there any left? Yes, these are still available, I'm sending you a message. They are in the 25 lb range. Are the corners grommeted & laced with rope, so the sidewalls can be rolled up independently of the front & back? Just thought I'd ask, so you could point it out as an additional feature. If they are, it's a real plus because the flaps and ends roll up & tie very neatly. That lets you air everything out during the day and you can just use it like a tarp/canopy for shade in the heat of the day. I've got one of these nice B.S.A. tents that's at least 30 years old & can vouch for the great quality! Excellent question, I haven't set one up but I'll ask the guy that makes them and find out. 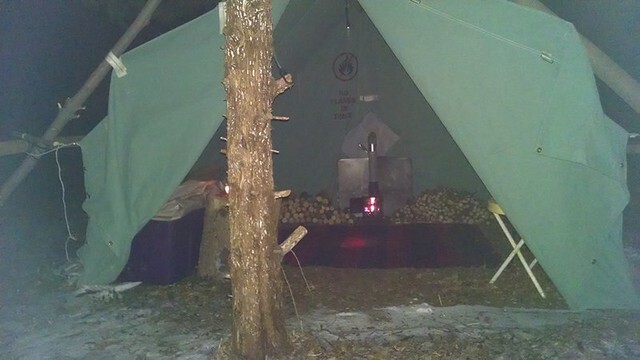 I checked today, the side walls do indeed roll up independently from the front and back of the tent. Do you still have any of these tents left? I'd be interested in one. First let me welcome you to Blades and Bushcraft. Second, I sure do have them available. PM sent. How would I go about ordering one of these Boy Scout tents? How do you think they would work for a hunting tent in Alabama? I think they would work just fine as a hunting camp tent. If you want to order one just PM me with your zip code so I can figure shipping and I'll give you payment instructions. Just had to write this. 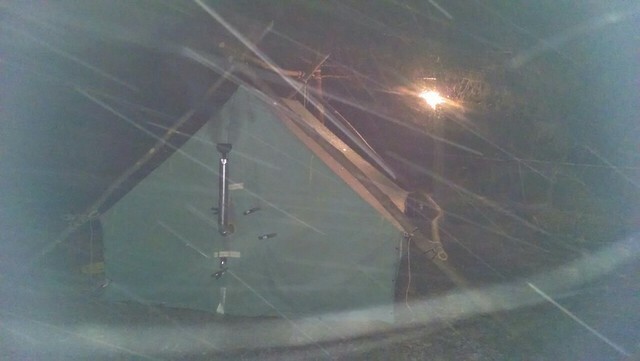 I put up the tent up in my backyard just before the storm arrived here in PA. We spent part of the day building a snow wall around it then stopped for a fire outside and a nice meal inside. It worked great! Just an occasional tap to get the snow off. Other than that is was excellent. We're expecting more snow tonight so I'm out for a night snooze in a moment. Thanks for a great tent! These tents are great. Do you still have any available? I'd be interested in buying a few. I do have some available. Shoot me a PM with your address and how many you are looking for. I'll figure you a total with shipping and give you payment instructions. I have one of these left and when its gone that's it. There won't be any more. I will mention it to my oldest son. He & I were talking about tents couple weeks back & since the grandboys are getting bigger, he could use a larger tent. He mostly car camps with his family, so the size/weight would not be an issue for him. They went on a road trip/vacation to Calif. last week, & I think he returns today or tomorrow & I will try to remember to mention it. Thanks JB, just let me know. I had forgotten Mike. They ended up staying a couple more days & had to get some work done on their vehicle before crossing back to MN. When they returned fromthe vacation, and after hearing of their having to spend the knd of money to get their vehicle repaired. Buying a tent wasn't part of the equation. Ooops. Waaalll....Crap happens... Glad to hear they are still available one "my" end, but if someone gets there first... Well... them is the breaks. He will be coming up this weekend & I will try to remember to mention it again then. Gonna smoke about 80 -100 racks of ribs for a festival,& he is the "helper". "Captive audience" anyway. I will try to remember, regardless...I will do my best to let him know. No problem JB, my supplier came up with some more tents so I should have them available for a while yet. Those are great tents that have given me many of fond memories from my Scouting days. I can't wait to get mine situated. Great price compared to some of the prices I've seen while browsing around. That is awesome mas. I have one needing to be set up. I'm hoping I get started this weekend. If my luck runs, I may get a pic of the tent and the beast around the 20th! The way you set yours up with the external poles may tweek my plan a little bit. Great job. Also. Is the 9 x7 length and width seem about right. I'm temped to unfold mine and measure the seams. How did you work the stove jack? Did you cut the canvas or is it just the stove jack square clamped in place to the existing door cut? Veteran's Day special, these are 25% off at $145.99 plus shipping. Where's my canucks bro wannabe.....? Folks I'm going to put one more up for sale at this sale price $145.99 + shipping. Thanks Zammer, wannabe and I already spoke . Just another bump, these are on sale until the end of the week. Got mine this afternoon. Absolutely amazing. I can't thank you enough. Brand new not gov't surplus for that price. I will cherish it. I can't wait until next spring. Beast! I almost threw them away. Always check your packages from mike. He threw in a pair of wool finger mittens. Man they fit good too. My last order had p51 can openers thrown in. Great doing business with you always. Thank you.! I want to set up a seating area like this with the tent nearby. So that's where all my missing stuff ended up . Glad you like the mittens and especially the tent, that sitting area is going to be awesome. In case anyone else wants one of the scout tents the sale is going on until midnight tonight. I just have it clamped for now. I bought an old Singer to sew the stove jack in, but I need lessons on how to operate it - haha! Do you still have any of these available? Sorry, these are all gone.